Royal Caribbean Galveston offers cruisers the convenience of travelling from or close to their home state and because of Galveston’s proximity to several large metropolitan areas, and location on Galveston Bay, it is no wonder this is a premium departure port for many travellers. Just 30 minutes of cruising and you are in the Gulf of Mexico, allowing the fun to begin. Cruises departing from Galveston, TX include several offerings of various lengths to the Caribbean and one transatlantic sailing that includes stops in Portugal, England and Spain. The majority of departing ships are bound on Western Caribbean cruises and include ports of call such as Cozumel, Roatan, Jamaica, Grand Cayman, Belize and others, depending on your sailing date and itinerary. These cruises come in all sizes to suit all vacation plans and budgets, all from the port that is close to home in Galveston. Royal Caribbean Galveston offers travellers first class service, safe, patrolled lots to park with a free shuttle bus to the cruise ship terminals, a port that is easy to get to navigate from many major highways and one that is close to the airport. It is a bustling port for both cargo and cruise ships, but the efficiency of the service allows you easy departure and arrivals, which is a wonderful way to start and end your cruise vacation. 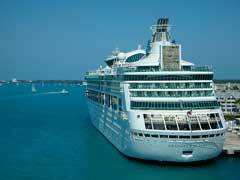 Royal Caribbean’s Mariner of the Seas makes frequent sailings from the port in Galveston. Several upcoming sailings on this ship take you to the beautiful ports of Cozumel, Grand Cayman and Jamaica on a 7-night cruise from just $529pp. This roundtrip vacation is available for departure on many dates in November and December of 2012 as well as January-April of 2013. For cheap cruises to the Caribbean, Royal Caribbean is offering a 4-night short getaway that starts at just $379pp. This cruise takes you to Cozumel, Mexico and back for a great vacation in the sun aboard the Navigator of the Seas. Royal Caribbean Galveston is your port of choice for holiday sailings as well, letting you enjoy Christmas or New Year’s in an exciting port of call. Whether you want a quick trip to the sun, a chance to get away from it all, a full-fledged cruise vacation or even a transatlantic journey, Royal Caribbean Galveston has you covered. Forget about flying to your departure city, enjoy the freedom of heading down to Galveston to catch that dream vacation, they’ll be waiting for you.